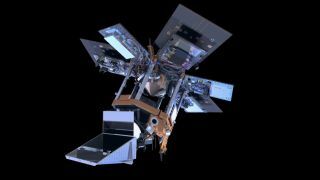 An artist's illustration of the European Sentinel-5P satellite built to track global air-pollution levels from space. A European satellite built to map Earth's air like never before will launch into space early Friday (Oct. 13), and you can watch it live online. The Sentinel-5P satellite of the European Space Agency (ESA) is scheduled to lift off aboard a Rockot launch vehicle at 5:27 a.m. EDT (0927 GMT) from the Plesetsk Cosmodrome in northern Russia. You can watch the launch live here beginning at 5 a.m. EDT (0900 GMT), courtesy of the ESA. You can also watch the launch directly from the ESA here. Sentinel-5P (the "P" stands for "Precursor") is designed to track global air pollution from orbit in unprecedented detail. The satellite is part of the European Union's Copernicus program for Earth-monitoring missions, but it is the first dedicated to creating a global map of air quality every 24 hours. At the heart of Sentinel-5P is Tropomi (short for Tropospheric Monitoring Instrument), which will map air quality along a swath 1,801 miles (2,900 kilometers) wide from an orbit 512 miles (824 km) above Earth. The instrument will monitor trace gases that affect the air we breathe, such as nitrogen dioxide, ozone, formaldehyde, sulfur dioxide, methane, carbon monoxide and aerosols, according to an ESA mission description. The European Space Agency's Sentinel-5P satellite is hoisted up onto its Rocket launch vehicle at Russia's Plesetsk Cosmodrome ahead of a planned Oct. 13, 2017, launch. "Every day, Tropomi will make almost 20 million observations of important air pollutants and gases affecting the climate," Pepijn Veefkind from the Royal Netherlands Meteorological Institute (KNMI) said in a recent statement. "KNMI will use this data to improve air-quality forecasts and to keep a close eye on emission increases or reductions, and to monitor what mitigation measures are effective in protecting the air we breathe."